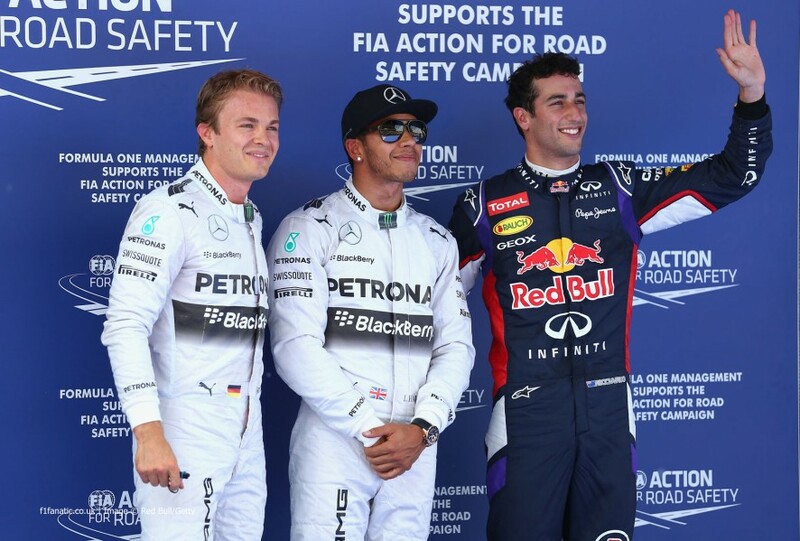 Formula One: Hamilton leads Mercedes front row lockout in Spain! 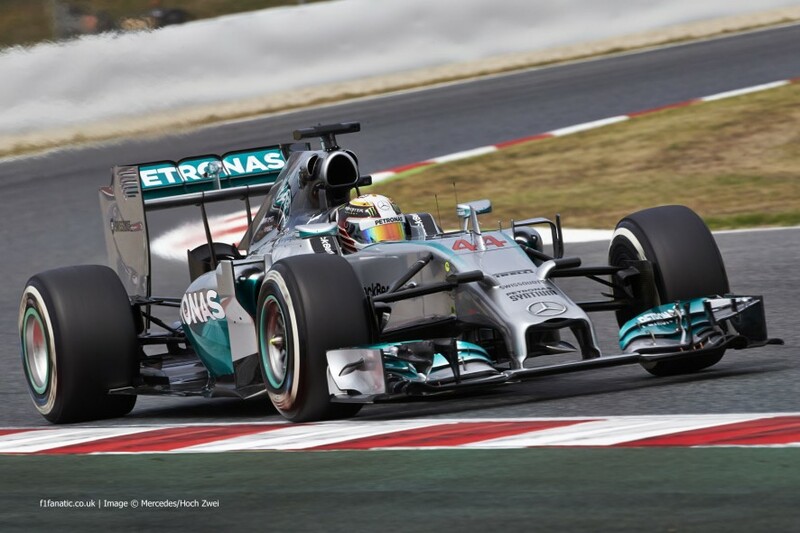 Home » Formula One: Hamilton leads Mercedes front row lockout in Spain! Lewis Haimlton has once again taken pole position in qualifying for this weekend’s Spanish Grand Prix at the Circuit de Catalunya. It looked as though the advantage was with his team-mate Nico Rosberg, but Hamilton resisted to take his 4th pole position of the season. Daniel Ricciardo will line up 3rd behind the two Mercedes, whilst his team-mate Sebastian Vettel will start 15th after stopping on track in Q3 and earning a 5 place grid penalty for a gearbox change. 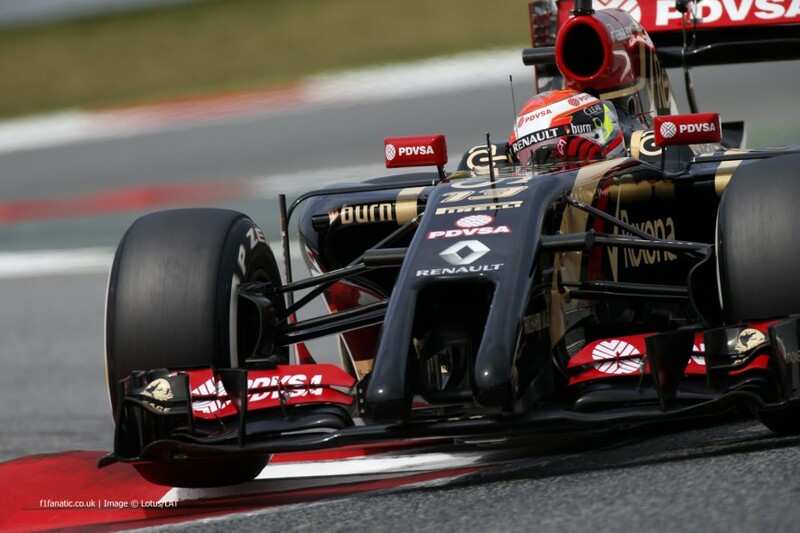 Qualifying hadn’t long been under-way before it was interrupted by Pastor Maldonado. The 2012 Spanish GP winner had been looking relatively fast in the Lotus during practice, but lost control of the car in turn 3. He hit the wall and bought out the red flag; putting a sudden end to any thoughts of a good result in qualifying. The session, and normality, resumed soon afterwards, with the two Mercedes drivers putting themselves 1st and 2nd. Rosberg was the man to lead the way, with Hamilton setting a fastest first sector before fading in the final two. Both drivers set their laps on the slower, medium tyres and were hoping that their pace would mean that they wouldn’t have to use a set of the faster tyre to proceed into Q2. Home hero Fernando Alonso took a risk in the closing stages and decided not to do a second run in his Ferrari. He was almost eliminated but the gamble paid off, meaning that he, like the Mercedes duo, had an extra set of tyres to use if he should need to. Jenson Button and Sergio Perez were on the verge of being knocked out in Q1, but late improvements from the ex-team mates saw Adrian Sutil be knocked out along with the Marussia pair, the Caterham pair and Maldonado in the stricken Lotus. Sutil’s elimination carries on the trend of a Sauber not reaching Q2 in every race this year. Rosberg’s advantage over team-mate Hamilton continued into Q2, with Rosberg setting the fastest time of the session. Nico took over the top spot from early pace setter Kimi Raikkonen to set a time that would be just over a tenth quicker than Hamilton. Lewis had reported in Q1 that the team had made his car worse and that he was starting to struggle behind the wheel. Two drivers failed to set a lap time in Q2, with Jean-Eric Vergne deciding not to run due to his 10 place grid penalty for losing his wheel in practice. Kevin Magnussen also chose not to run, with McLaren reporting that the Dane had suffered a failure with his energy recovery system. With Vergne already out, his team-mate would join him at the end of the session. Kvyat was just ahead of Gutierrez who put his Sauber in 14th place ahead of the two cars which didn’t run. 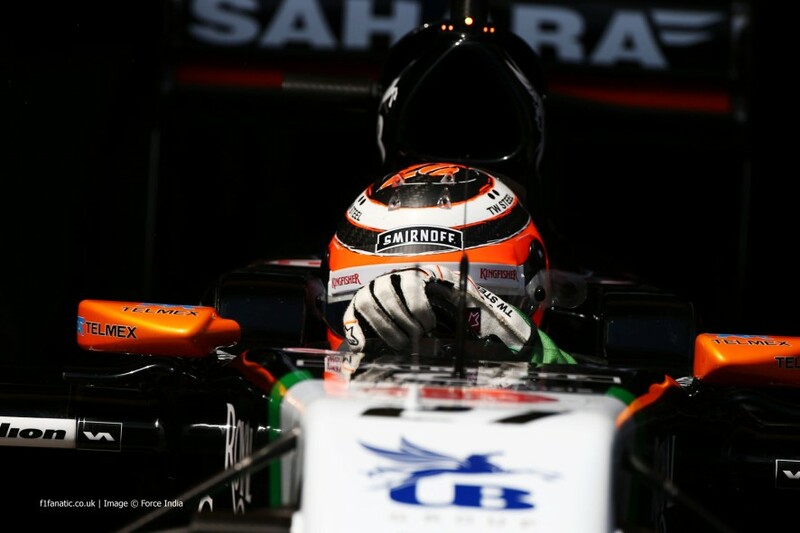 After sneaking into Q2, Sergio Perez couldn’t advance any further than 12th place, with team-mate Nico Hulkenburg just missing out on a top 10 spot in the sister Force India. Fernando Alonso was incredibly lucky to make it through into the top 10 shoot-out as he placed his Ferrari in 10th place; less than a tenth ahead of Hulkenburg’s time in 11th. The top 10 shoot-out would see both Mercedes, Red Bull, Ferrari and Williams cars, along with Romain Grosjean’s Lotus and Jenson Button’s McLaren fight it out for a prime spot on the grid for the Spanish Grand Prix. Although it already looked as though it would be one of the Mercedes cars to start from pole once again. Q3 began in a very similar way to Q1, with the Red Flag being deployed almost immediately. The cause was Sebastian Vettel, who came to a stop at turn 3 after losing drive due to a gearbox failure. This initially meant that Vettel would start from 10th, before the FIA gave him a 5 place grid penalty for an unscheduled gearbox change. This left 9 drivers to qualify in a shortened 8 minute session, with Lewis Hamilton looking to fight back against team-mate Rosberg’s pace in the first two sessions. Hamilton set the benchmark early on when he set a time that was almost 3 tenths quicker than his team-mate. With the clock ticking down to zero, all the drivers were out on track to set another time. Rosberg managed to find almost a second advantage on his second lap in a superb effort, but Hamilton did the same and went 2 tenths quicker than Nico to take his 4th pole position out of 5 this season. Ricciardo managed to put his Red Bull 3rd on the grid, but was still just under a second slower than Hamilton’s pole position time. Valterri Bottas was one of the surprises of the session after lifting his Williams up to 4th at the last moment. Romain Grosjean was the second surprise after qualifying in 5th for Lotus; a certain sign of improvement after a tough start to the season for Lotus. Kimi Raikkonen and Fernando Alonso put their Ferrari’s in 6th and 7th ahead of Jenson Button’s McLaren in 8th and Felipe Massa’s Williams in 9th. Sebastian Vettel, as mentioned previously, didn’t set a time in the session. * – Sebastian Vettel received a 5 place grid penalty for a gearbox change. ** – Jean-Erice Vergne received a 10 place penalty for losing a wheel in practice.